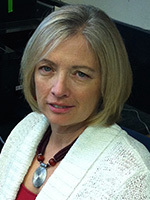 Sue Brown is a University Distinguished Professor of Biology at Kansas State University. She has spent most of her career developing genetic and genomic tools for a genetic model organism, the red flour beetle, Tribolium castaeum. Her research interests include developmental genetics and genomics. Sue received a PhD in Genetics from the University of Missouri in Columbia. She has published more than 100 peer-reviewed articles, serves as associate editor for BMC Genomics and recently coedited a special interest issue of Current Opinions in Insect Science focused on genomics. Sue teaches genetics and bioinformatics classes.